Job Posting - Job Coach - Eagan - ProAct, Inc. Serving people with disabilities for more than 45 years. Are you passionate about helping others in the growing human services field? If so, come and join an energetic team committed to making a positive impact on the lives of individuals with disabilities. 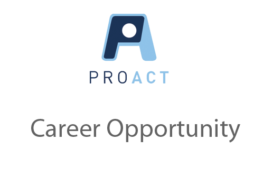 ProAct Inc is a private, non-profit organization looking for talented people with solid verbal and written communication skills and creative problem solving abilities. *Must be able to pass CPR and 1st Aid Certification. *Experience working with people with disabilities. *Positive work history with human services experience.